According to Physicians for a National Health Program (PNHP), universal healthcare in America would save about $500 billion annually – by eliminating insurer middlemen and the bureaucratic nightmare it creates for physicians and hospitals. Individuals wanting coverage this way could still get it. Under a single-payer system, a public or quasi-public agency would administer healthcare coverage and financing, while delivering it would remain private, patients free to choose their providers. Because of insurer middlemen, along with lack of regulatory restraint on drug companies and large hospital chains, healthcare in America cost twice as much as in other developed countries. Most nations have some form of universal coverage, not America under marketplace medicine – except for eligible Medicare and Medicaid recipients. Hundreds of billions of dollars are wasted annually, unrelated to patient care – including insurers’ overhead, underwriting, billing, sales and marketing departments, as well as huge profits and exorbitant executive pay. Doctors and hospitals must maintain costly administrative staffs to deal with the bureaucracy, amounting to nearly one-third of annual healthcare costs. No one ever visited an insurer to receive treatment for what ails them. Eliminating them would be a major cost savings. Universal healthcare could provide everyone in America with all vital services – including medical and dental; prescription drugs and medical supplies; mental health and reproductive care, vision and optical services, hospitalization and preventive care, along with long-term care for the elderly, infirm and disabled. Deductibles and co-pays would be eliminated, while coverage of this fundamental human right would improve, especially for the nation’s most disadvantaged. Lack of insurance and underinsurance for unaffordability reasons would no longer exist. 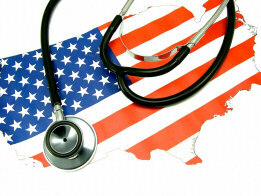 Healthcare rationing based on the ability to pay would disappear. Millions in America are uninsured or way underinsured under Obamacare. Trumpcare if enacted into law would be much worse. When I finished graduate school in 1960, healthcare in America was 5.1% of GDP. Last year it was 18%, heading toward around 20% in 2020. Since 1960, annual per capita healthcare spending in America increased a shocking 75-fold – from $147 to an estimated $11,193 in 2018. In inflation-adjusted 2010 dollars, it rose from $1,082 to the above estimated figure, around a 10-fold increase, still an enormous amount, making proper care unaffordable for millions of Americans. According to a study by George Mason University’s Mercatus Center, a libertarian policy research think tank, Medicare for all would save about $2 trillion over the next decade – a conservative estimate. Likely triple this amount would likely be saved, yet $2 trillion alone is a compelling argument for how healthcare in America should be provided – everyone in, no one left out, by eliminating bureaucracy, providing care to no one. The Mercatus Center report explains the enormous administrative cost savings from a single-payer system, enabling far less costly first-class healthcare for everyone in America. Citizens of the world’s richest country deserve no less. Healthcare is a fundamental human right, essential to life and well-being. It’s not a commodity to be sold like toothpaste – based on the ability to pay. Universal single-payer coverage would transform America’s dysfunctional system into an equitable and just one – prioritizing human health over profits.